No matter what team you are rooting for (GO SEAHAWKS! ), you will have a great Super Bowl party when you have snacks from Office Snax. 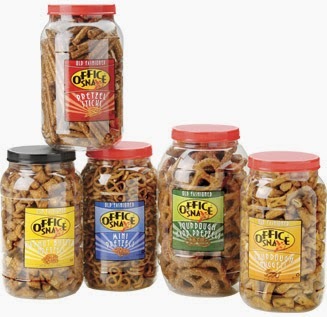 They offer a wide variety of snacks that all come in a resealable tub. 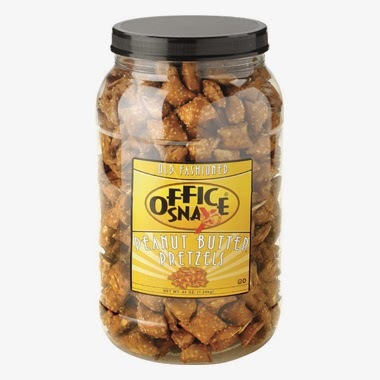 Our friends at Penny Wise office Products sent us a tub of Peanut butter pretzels and I could not wait until the Super Bowl to try them. They are so yummy. They have a crispy, crunchy outside filled with a smooth , creamy peanut butter. This is the perfect snack for any Super Bowl party. 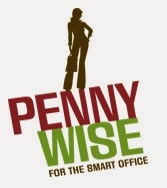 Penny Wise Office Products is a woman owned company, catering to stylish, busy women – like you! They have 40 distribution centers across the country, and offer free next day delivery on over 40,000 products for your home or office. Ask for their Free Full Line Catalog by calling 1-800-942-3311 or online: www.penny-wise.com. Penny Wise has offered to send one of my lucky readers a tub of the Peanut Butter Pretzels in celebration of the Super Bowl! Enter via the Rafflecopter below. Reviewz & Newz nor any participating bloggers are responsible for shipment of prize. Tell me what team you want to win the Super Bowl AND your favorite Super Bowl food or snack! I would like for the Seattle Seahawks to win. My favorite Super Bowl Food? Grilled steak and corn on the cob. I want Denver to win and my favorite gameday snack is meatballs. I like denver to win! I would like the Seahawks to win, and my favorite snack is nacho cheese type dips! I'm rooting for the Broncos... but actually will just be watching for the commercials this year. I was really hoping the 49ers could pull it through... so, sad panda here! And I LOVE hotwings! Seahawks and vegetarian seitan wings! Or maybe some pretzels in some french onion dip! I am rooting for the seahawks my son loves that team. We love my world famous nachos. Broncos and my my favorite food would be pizza! i guess i'll pick seahawks. i love pigs n a blanket. I think the football team with the highest score will win, LOL, I really have no favorite of these two, but lets go for the Seahawks, and we could have Seahawk bar be que wings if we can find any at this date, seriously I love Nachos on football days..
Seahawks! Buffalo wings and queso! I don't know who is playing in the super bowl. I see people saying seahawks so maybe them. I am not into sports at all. I love chips and dip for snack. Could careless who win and BBQ wings! Don't really care, but I will say Seahawks. My favorite snack is BBQ chicken wings. Either team would be great! It would be nice for the Seahawks to get a ring though. Love the buffalo chicken dip! My team isn't playing, but go Seahawks! Not to copy everyone else, but buffalo chicken dip is addicting. I'd like the Broncos to win and my favorite super bowl food is chips and salsa! Broncos all the way! Also queso dip and chips! I was rooting for Denver because I wanted Manning to get another ring. I prefer finger foods like corndogs and chips. i was going for the seahawks to win, and my favorite food is pizza! Seahawks. Favorite food is pizza.